It has now been exactly a month since the day Truman arrived. In this short time he has learned so much. I got him back to eating since his arrival and got him accustomed to my household and myself. I switched him to a color free Roudybush diet. I converted him to drinking from a water bottle. I have trained him flight recall. He modeled target training behavior off of Kili. I introduced the two parrots to each other and reduced fighting/aggression. I have tamed Truman to let me open his wings and hold him on his back. I accustomed Truman to putting on a flight harness and began taking him to the park. And finally I taught him the wave trick on cue. Looking back, this is a phenomenal amount of progress in so little time. Essentially the first two weeks I just sat back and let him get used to things so a lot of this progress has come more recently. Truman is progressing at a fantastic rate which makes me optimistic about his future. He has also put on some good weight. He was dipping below 300g when I first got him and now he packs on a max of 330g. The newest accomplishment I would like to share is finally putting Kili's cage back to the bird area. For the last month while Truman was here, as well as several months before his arrival, I had Kili's cage in a different area in preparation for quarantining Truman. 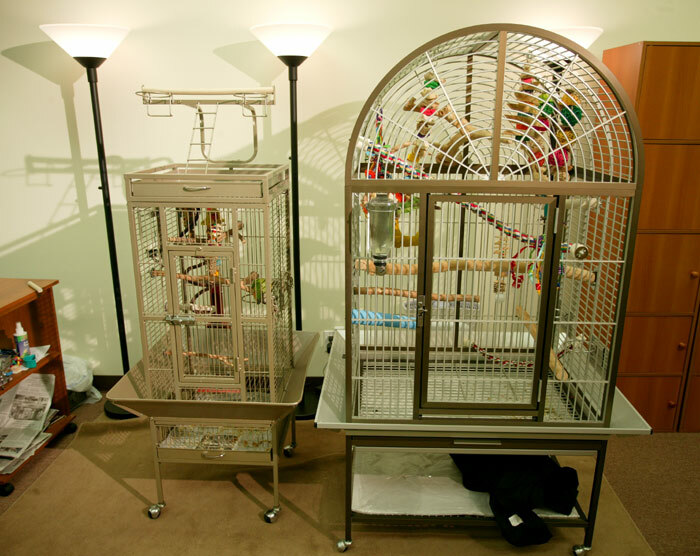 While the quarantine failed as the result of parrots flying around, I still kept the cages separate for some time to prevent aggression and to prevent Truman from bonding to Kili rather than me. After a month of tremendous progress, bonding, and safe introduction to Kili, I decided that putting their cages together at this point will be just fine. And it certainly has been going just fine. Kili does not make any aggressive advances to Truman when they are in their separate cages and they seem to be getting along just fine. I had them in much closer range when I trained them on a single perch, so the natural unsupervised distance is much greater. The move was gradual but quick. For about two days I moved Kili's cage halfway toward Truman's. For one day I had her cage in the bird area but as far away from Truman as possible (about 3 feet). And then finally I went all the way and brought the cages together to their long term spots. To even go a step further, I let the two parrots play on top of Kili's cage. I was curious to see if Kili would exhibit territorial aggression or not (as they had been previously introduced on neutral territory). The good news is that for the most part they got along just fine. Truman was more concerned with playing with Kili's toys and Kili just wanted attention and petting. Kili has been molting a lot lately and loves petting like never before. She even bent her head down to Truman invitingly. Truman took up the invitation and walked over to preen her but the moment he got close Kili snapped at him. She's a tricky little devil. I am glad to have my apartment back in order with the birds a bit away from where I spend my time. They seem to be getting along just fine with only an occasional squabble here and there. I think Kili finally found her match. awww! they're sooo cute together! glad theyre friends! I really wasn't expecting them to get along in such a short period of time! And I'm very surprised that Kili is letting him in her territory. Great work, Michael! She isn't, I'm just forcing them to tolerate each other. If I can get them to sit on the same 12 inch perch, then getting them to sit a bit further apart in a natural circumstance is even easier. Yesterday I had them out on the floor to play. Kili didn't even try to attack him. She played with some stuff and then mostly focused on coming over to hand out with me. She didn't pay any attention to Truman at all. Things are definitely beginning to work out. why water is green ?? Actually it's cause Truman is behind the bottle and he's green. Hi Michael: That looks pretty good. At first, you can see Kili giving Truman a bit of "stink eye" but toward the end of the video, she has softened. It's so funny to see her scratch her head when she wants to be petted. All three of my Senegals do that. They do it to people and they do it to each other. It is such a clear communication...."pls scratch my head". Only my Senegals do it...not the greys. I think you are on the right track to helping them learn to read each other and also, teaching them to be flock mates. Thx! I noticed you use water bottles for your parrots. What brand do you use? The ones I've bought so far haven't been working and I'm not sure which brands work well. [quote="CarlosQuaker":3a0mqnk7]I noticed you use water bottles for your parrots. What brand do you use? The ones I've bought so far haven't been working and I'm not sure which brands work well. [/quote:3a0mqnk7] I use glass bottles from Lixit, they are great. The metal frame keeps them totally secure and allows easy access for cleaning and changing water. They are pricey though .